Cubs' Curse Of The Billy Goat And Other Superstitious Sports Tales : The Two-Way If the New York Mets win Game 4 of the National League Championship Series tonight, the Chicago Cubs' season and World Series dreams will be over. The Curse of the Billy Goat, however, will live on. Billy Goat Tavern owners pose with "Billy" the goat outside the tavern on Oct. 20. 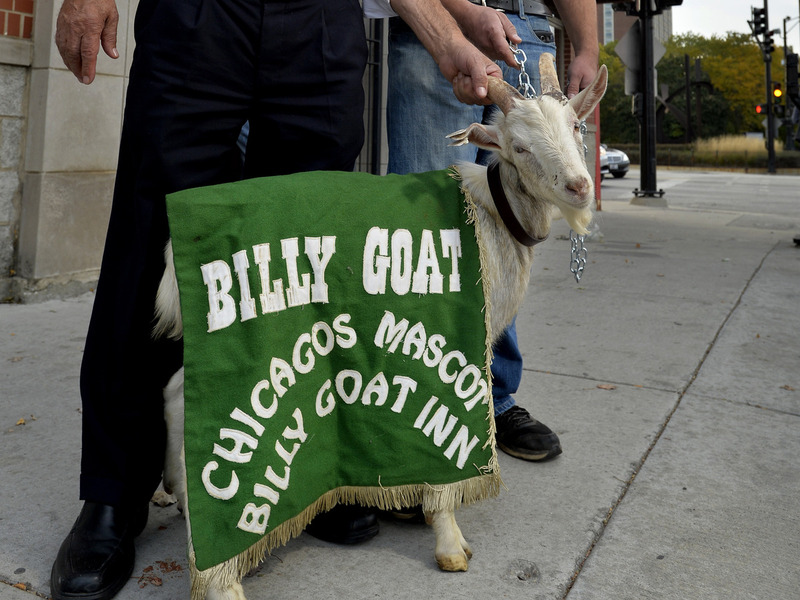 The Chicago Cubs have not appeared in a World Series since 1945, when, legend has it, tavern owner Billy Sianis placed a curse on the team in retaliation for refusing stadium entry to his goat. Going into Wednesday night's potentially decisive Game 4 of the National League Championship Series trailing the New York Mets 3-0, it seems the Cubs' "curse" is as strong as ever. "According to legend, the goat and Billy were upset, so then Billy threw up his arms and exclaimed, 'The Cubs ain't gonna win no more. The Cubs will never win a World Series so long as the goat is not allowed in Wrigley Field.' The Cubs were officially cursed. Subsequently, the Cubs lost game four, and the remaining series[,] getting swept at home and from the World Series. Billy Goat promptly sent a telegram to P.K. Wrigley, stating, 'Who stinks now?' "
Seventy years later, the Cubs have yet to make it back to the World Series, and their fans have adopted the unofficial slogan, "Wait 'til next year." The Boston Red Sox's Doug Mientkiewicz (left) and catcher Jason Varitek (right) jump into Keith Foulke's arms after the Red Sox defeated the St. Louis Cardinals 3-0 in Game 4 to win the 2004 World Series. The Cubs' curse is one of the most storied and enduring in baseball, along with the Red Sox's since-broken "Curse of the Bambino." That myth goes something like this: Babe Ruth, nicknamed "The Bambino," had been a star for the Red Sox from 1914-1919; when he was sold to the rival Yankees, the baseball gods leveled their punishment. "When Babe Ruth was sold in 1920, the Boston Red Sox had won five World Series titles, more than any other major league team. Up to that point, the Yankees had never won one. However, since Babe Ruth arrived with the Yankees in 1920, this fabled franchise has been to the World Series 37 times and has won a staggering 26 times, including four titles with the Babe. The Red Sox, however, have had a far different outcome. "After selling Babe Ruth to the Yankees, the Red Sox did not win another Championship for 86 years (until 2004). It was a period full of heartbreaks for everyone affiliated with the Red Sox — from the players to the ever-faithful fans. The causes were many — bad management decisions, unfortunate errors and an almost-ironic amount of incredible bad-luck." Much was made of the curse's end, and since 2004, the Red Sox have gone on to win the World Series twice more, in 2007 and 2013. 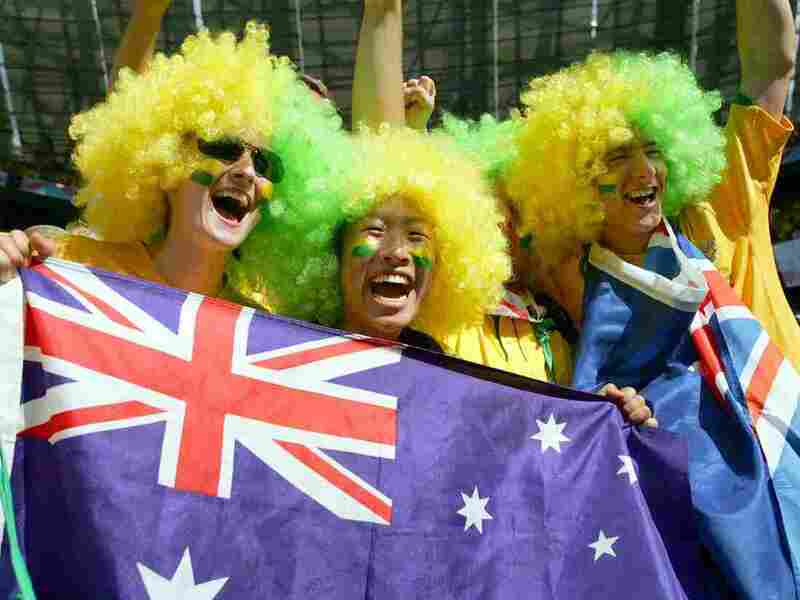 Australian national soccer team supporters at the 2006 World Cup in Munich. "The story begins in 1969, when the Australians were trying to qualify for the 1970 World Cup. The team had lost a play-off and was to face Rhodesia (now Zimbabwe) in Mozambique. "The players left the country without paying up and Johnny sincerely believed that, ever since, Australian soccer has been cursed. "The national team qualified for the 1974 World Cup but suffered a run of gut-wrenching defeats, topped off by the 1997 Iranian disaster and the tear-jerker in Uruguay four years ago. When Warren told him the story last year, Safran decided to go to Africa to do a story about the curse for his show John Safran vs God. The witchdoctor had died, but Safran found another who could channel him by going to the stadium at which the Rhodesia game had been played 35 years earlier.
" 'That involved us sitting in the middle of the pitch and he killed a chicken and splattered the blood all over me,' Safran said. 'I then had to go to Telstra Stadium with Johnny and we had to wash ourselves in some clay the witchdoctor had given us.' "
The antics apparently did the trick, as the team went on to qualify for the 2006 World Cup.